The Aggies gained 315 total yards while allowing Cal-Poly 265 yards. Sophomore quarterback Tyler Rogers looked comfortable in the pocket during his first start, going 18-of-27 for 118 yards, two touchdown throws and one interception. The NM State ground attack also looked in midseason form as the Aggies almost rushed for 200 total yards, finishing with 197 yards on the ground. Freshman Larry Rose III led the way for the NM State running back core, finishing with 150 yards on the ground on 30 carries during his first game as an Aggie. Rose III scored twice, once on the ground and another on a touchdown catch. Redshirt sophomore Teldrick Morgan led the receivers with six catches for 51 yards and a touchdown. As impressive as the offense was, perhaps more dominating was the young NM State defense, especially in the second half. The Aggies shutout the Mustangs in the second half, making play after play, while only allowing a total of 27 yards in the final half. After allowing 236 rushing yards to the run-oriented Cal-Poly offense in the first half, NM State only allowed 23 rushing yards in the second half. Freshman linebacker Derek Ibekwe led the defense with a total of 14 tackles and half a sack in the game. Fellow linebacker Rodney Butler also had double-digits tackles, 11, and also had a sack on the quarterback. The Aggies kicked off the 2014 season with an 11-play, 75-yard drive that culminated in a 30-yard touchdown pass from Rogers to Morgan. Rogers and Rose III both had big plays on the drive, the Aggie quarterback with perhaps the biggest after completing a 15-yard pass on 3rd-and-5 while under heavy Mustang pressure. Rogers went 5-for-5 on the drive, while Rose III ran for 11 yards including a couple of first downs. Cal-Poly answered right back, however, with an 11-play drive of its own. NM State appeared to have stopped the Mustangs on a 3rd-and-5 on the Cal-Poly side of the field, but a 15-yard personal foul penalty gave the Mustangs an automatic first down. Eight plays later Cal-Poly would tie the game at seven on a short 3-yard run with just under five minutes left in the first quarter. Rose III looked impressive during the Aggies’ next drive, pulling out runs of eight, 11 and seven yards. But a batted ball on third down forced a NM State punt after just five plays. The first quarter would end would the teams knotted at seven. Four plays into the second quarter the Aggies would get their first big defensive play of the season. With the Mustangs driving, senior cornerback Winston Rose intercepted a pass from Cal-Poly quarterback Chris Brown and returned it 10 yards to the NM State 37-yard line. The Aggies would capitalize on their first takeaway of the season by going on another 10-plus play drive, this time a 10-play, 63-yard drive that gave NM State a 14-7 lead with 8:07 left in the half. NM State was aided by two big third-down plays during the drive, one running and one passing. The first came after Rose III broke off an 8-yard run on 3rd-and-1 to take the ball into Mustang territory. Two plays later, on 3rd-and-3, Rogers hit redshirt freshman Gregory Hogan down the middle for a 25-yard pass play to take the Aggies into the red zone. After a holding penalty in the end zone, sophomore running back Xavier Hall picked up his first rushing touchdown of the season after going in from a yard out to give NM State the lead. Cal-Poly looked to answer again, driving into Aggie territory. But a sack by junior Alex Trujillo on third down inside the 40-yard line forced a Mustang punt. Two dropped passes late in the half by NM State gave Cal-Poly one final chance to score in the half. The Mustangs took advantage as running back Chris Nicholls broke off a 39-yard run that put the ball on the Aggie 13-yard line with under two minutes left. The NM State defense would clamp down however and hold Cal-Poly to a 24-yard field goal with 20 seconds left in the half. The Aggies would head into the locker room with a 14-10 lead. Rogers went 7-of-13 in the half for 86 yards and a touchdown. Rose III, meanwhile, already had 70 yards on the ground on 13 carries in the first half. Morgan had two catches for 34 yards and a touchdown. On the defensive side, Ibekwe almost had his double-digit tackles in the first half, finishing with nine. The Aggies committed their first turnover of the season during their first drive of the second half as Rogers was intercepted by Cal-Poly’s Chris Fletcher in Aggie territory. NM State, however, would get the ball right back on the next play as the Mustangs fumbled the ball on a quarterback pitch. The Aggies were back in business as freshman linebacker Jaden Wright fell on the ball close to midfield. As in the first half, NM State would turn the Cal-Poly turnover into seven points. The Aggies would convert two big third downs along the way, the first coming when senior running back Brandon Betancourt scrambled for 17 yards on a 3rd-and-5. NM State continued to pound the ball and on a 2nd-and-goal Rose III picked up his first touchdown of his Aggie career. The freshman running back did not pick it up on the ground, however. Instead he caught a pass from Rogers in the flat for a 6-yard passing touchdown. Rogers’ second touchdown pass of the day made it 21-10 NM State midway through the third quarter. After each team traded punts the Aggies would hold on to that lead heading into the final quarter. NM State got the ball back early in the fourth quarter and used quick, short passes by Rogers and tough runs up the middle by Hall to matriculate the ball down the field. A 13-yard run by Hall got the Aggies into the red zone. The roles reversed from the first half as this time Hall did the work and Rose III got the glory after running it in from six yards out for his second-consecutive touchdown and first rushing touchdown of his NM State career. The Aggies padded their lead to 28-10 with 8:51 left in the game. Although NM State scored two touchdowns in the final 30 minutes, the half really belonged to the Aggie defense, which shut down the Mustang offense for the entire half. Cal-Poly had six full possessions in the second half, NM State forced three 3-and-outs, one turnover, and did not allow a single point. After the Aggies scored their final touchdown, the Mustangs would have three possessions, two were 3-and-outs and final one came as the game ended. The Aggies will now head out on the road for the first time this season as they travel to Atlanta, Ga., to face their first Sun Belt Conference foe of the season, Georgia State. Game time is set for noon (MT) on Saturday, Sept. 6, inside the Georgia Dome. It will be the first meeting between the Aggies and the Panthers. 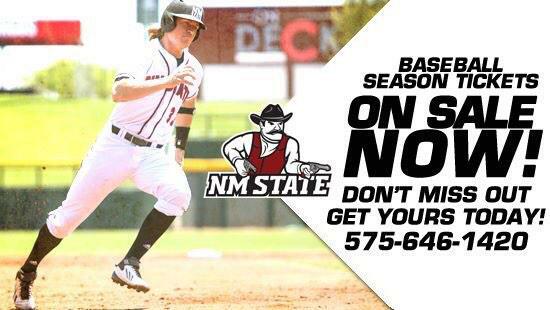 Next Home Game versus UNM September 20th @ 6PM Call 575-646-1420 or visit local Las Cruces Pic Quik's for Tickets! Students and fans were awesome tonight.Thats what it should be like! Let's keep the energy building.Together we can do special things. What a great way to start off the season with a W 28 to 10!!!!! AGGIES UP!!! Striking will be waiting till next game!